Cavan Genealogy, which is a ‘not for profit’ organization, is the dedicated Irish Family History Foundation member centre for County Cavan. It was established in 1987 to build a database of all sources of a genealogical nature that are known to exist for County Cavan and provides a professional, reliable and confidential service for those wishing to learn more of their family background in County Cavan. 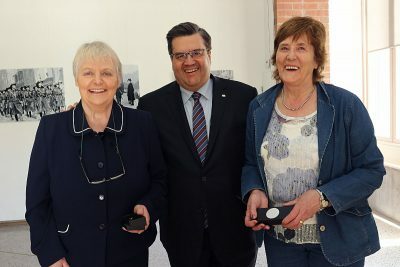 The manager (Mary Sullivan) and researcher (Concepta McGovern) between them have fifty years’ experience of sourcing and analysing local, national and international genealogical material and producing family history reports. 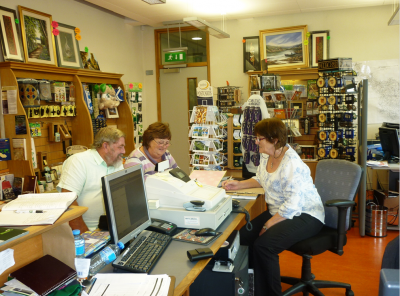 The centre also provides tourist information on behalf of Fáilte Ireland. There is no uniform starting date for church records. Each parish and denomination has different starting dates depending on the history and circumstances of each. For example, the records of the Church of Ireland parish of Kilmore begin in 1702 and the records for the Roman Catholic parish of Larah do not commence until 1876. The earliest Roman Catholic records are from the parish of Castlerahan and date from 1751. The centre has also computerized all civil marriages and deaths and is working towards completion of civil births for all of County Cavan’s Registration Districts from their start date in 1864 to 1910 and including non-Catholic marriages from 1845. The database includes complete returns for the 1901 and 1911 census and the 1841 census for the parish of Killeshandra. The Killeshandra returns include those from each household who had died in the previous ten years and those who were away from the household, either in the county, in other parts of Ireland or abroad. Complete returns for sixteen County Cavan parishes survive for the 1821 census. Although the originals for almost the whole country were destroyed in the Four Courts fire in 1922, the surviving sixteen for County Cavan had been copied and stored in Cavan Courthouse. Returns have survived for Annagelliffe, Ballymachugh, Castletara, Castlerahan, Crosserlough, Denn, Drumlumman, Drung and Laragh (joint returns), Kilbride, Kilmore, Kinawley, Lavey, Lurgan, Mullagh and Munterconnaught. Cavan Genealogy has computerized all surviving parishes. The database also includes pre and post famine land records, gravestone inscriptions, occupational directories, some school registers and numerous other smaller sources of a genealogical nature. The centre subscribes to Irish Newspaper Archives, an online database of Irish newspapers, which includes many of Ireland’s leading national, regional and out of print titles. It also subscribes to Newspapers.com, Find My Past and Ancestry.com which allows extra research to complement the centre’s own resources. The surnames in the database have all been standardized for ease of retrieval, while at the same time the original source spelling is retained on each record. For example the standard for Mc Avenue is Mac Givney and all searches are carried out using the standard spelling, which allows fast and efficient retrieval of the record or records. When the various sources are being computerized the original spelling (in the church, civil, census or whatever source) is recorded and afterwards standardized. Mac Givney is one of the surnames with the most variants so far encountered, 135 in total e.g. Magevna MaKevinee, Mc Avenue, Mc Avinue, Mc Evinie, Mc Evinnue, Mc Givenne, Mc Ivennia, Mc Kivinne, Mc Vinia, etc. The centre provides an information service for people, who are doing historical research, writing local histories, studying various topics or carrying out graveyard surveys and cleanups etc. Mary and Concepta have delivered numerous genealogy workshops/lectures throughout the county. Many exhibitions of historical interest have been researched and launched by the centre including ‘The Great Famine in Co. Cavan’, ‘Bailieborough Model School’, ‘100 Years of the Co-Operative Movement’, ‘Population Decline in County Cavan in the 19th Century’, ‘Aspects of Emigration from County Cavan’ and ‘The American Civil War’. A large ‘Cavan Diaspora Archive’ has been created as a result of the research service provided by the centre. Since its inception the centre has received visits and enquiries from all over the world from people of Cavan ancestry wishing to trace their family history. The enquiries are very varied in nature and provide much genealogical, family and personal information, not only through records left by the emigrants themselves but through oral family history passed down through the generations. They include emigrant letters or letters from Ireland to emigrants abroad, naturalization papers, obituaries, wills, extracts from family diaries, photographs and published biographical and other details from histories or newspapers abroad. This continually increasing archive in a very representative way tells the story of and maps the Cavan diaspora, not only the emigrant generation, but also their descendants. The centre regularly puts people in contact with other people researching the same ancestors, always with the consent of both parties. Cavan Genealogy also sell history and heritage books of local and national interest, including Breifne, the journal of Cumann Seanchais Bhreifne for Cavan and Leitrim, which is an important source for the history of the Breifne (Cavan and Leitrim) region.